Amid the start of monsoon rains, inhabitants of sprawling ethnic-minority Muslim Rohingya refugee camps are bracing for what is to come. Abul Kalam, 37, heads a five-member family that has been living in the Balukhali camp of Bangladesh's Cox's Bazar since November. Kalam fears their shelter of bamboo and polythene sheeting would not withstand a powerful storm. Six nearby dwellings collapsed during recent rainfall, but nobody was injured and they shifted to a new location in the camp. During intermittent downpours, Kalam's children cannot go to school and water trickles into their humble abode, making life uncomfortable. And bad weather inhibits Kalam from doing paid work for aid groups such as building shelters and toilets. "Often we don't have enough food to eat," he told ucanews.com. Mahmudul Hasan, 51, head of a 12-member family in Kutupalong refugee camp of Cox's Bazar since 2012, said his makeshift home was recently inundated, making it hard to get a good night's sleep. Camp administrators have moved some families protectively amid fears their dwellings could collapse. Those living on hillsides are most at risk, Hasan said. Some 855 shelters have already suffered weather damage. And an access road through the adjoining Kutupalong and Balukhali camps was made impassable. The World Meteorological Organization reported that even though overall monsoon rainfall was statistically near average last year, many parts of South Asia were affected by flooding. This was particularly the case in eastern Nepal, northern Bangladesh and adjacent areas of India. More than 40 million people were affected and an estimated 1,200 died. In recent weeks, more than 28,000 refugees in Bangladesh have been relocated as part of infrastructure development and risk mitigation. 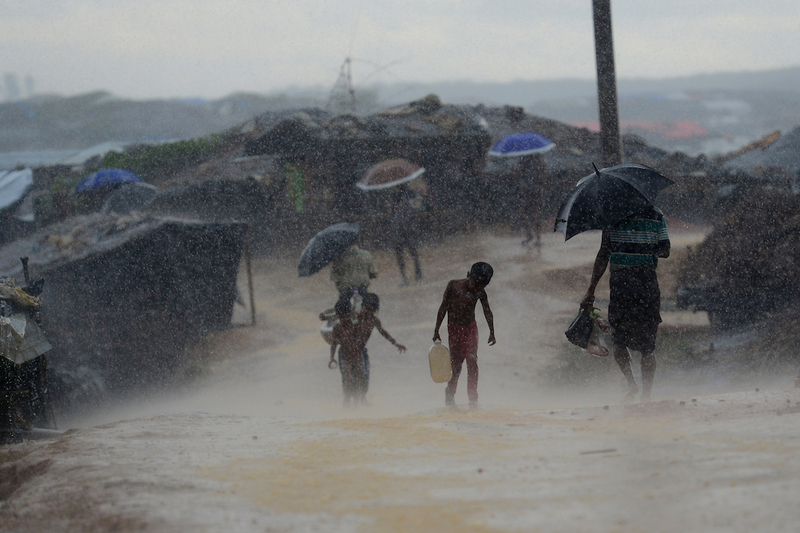 People judged to be endangered by the monsoon season were still being relocated to safer areas, according to a June 11 report of the United Nations Office for the Coordination of Humanitarian Affairs. More than 700,000 Rohingya Muslims have since August fled to Bangladesh from Myanmar's Rakhine State because of a bloody military crackdown in the wake of Rohingya militant attacks on police posts. Meanwhile, in Myanmar a group of parliamentarians has been debating establishment of an independent commission to probe rights' violations in Rakhine. The government on May 31 foreshadowed that the three-member commission would include an international representative. Pe Than, a lower house MP from a hard-line Buddhist group, the Arakan National Party, opposed such foreign involvement along with rejecting an advisory commission headed by former United Nations Secretary-General Kofi Annan. On June 11, the lower house of Myanmar's parliament, which is dominated by the ruling National League for Democracy of Aung San Suu Kyi, rejected the proposal as it stands by 251 votes to 138. Foreign emphasis on human rights could lead to action against Myanmar authorities in the International Criminal Court (ICC), Pe Than told ucanews.com. "So we are strongly opposed to it," he said. Military MPs are also against, on sovereignty grounds, foreign involvement in the so-far stymied independent commission. Civilian and military leaders on June 8 held a rare meeting in the capital, Naypyidaw, to discuss the highly politically sensitive issue. Suu Kyi, the nation's powerful State Counsellor, and military chief Min Aung Hlaing, were among 15 attendees. Myanmar faces mounting pressure from rights' groups who want the ICC to on June 20 discuss whether to launch its own investigation into crackdown abuses such as killings and rapes. Myanmar has rejected the bid on the basis that it is not a signatory to the so-called Rome Statute that underpins the international court.